PRESS RELEASE: Alesis, the world's leading manufacturer of professional audio equipment and studio electronics, introduces the AcousticLink, new digital recording equipment for guitar players. Alesis will showcase the AcousticLink at Booth #400 at the 2011 Summer NAMM show from July 21st- 23rd in Nashville, TN. 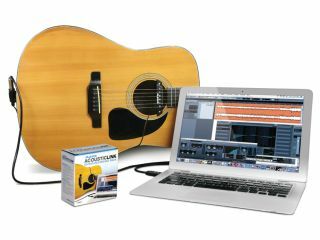 The AcousticLink contains a no-drill acoustic guitar pickup, the GuitarLink guitar-to-USB cable and Steinberg Cubase LE recording software: everything guitar and bass players need to connect and record from any guitar or bass to virtually any computer. The AcousticLink's single-coil guitar pickup is easy to install with no instrument modification necessary. The pickup is secured in a guitar's sound hole using soft, cushioned clamps, while its cable input is fastened to a guitar's strap peg using a flexible built-in harness. The AcousticLink's GuitarLink 1/4"-to-USB cable contains analog-to-digital conversion technology that will maintain the textured, rich sound of an acoustic guitar and can also be used with electric guitars and basses. Guitarists can record and produce tracks with the included Steinberg Cubase LE software, which features a full range of music production tools and a straightforward user interface. The AcousticLink can also be used with virtually any other music software. The AcousticLink digital recording system also works with Apple's iPad USB connector, enabling players to record their instrument directly into their iPad using apps such as GarageBand. AcousticLink works with Mac and PC computers, with a plug-and-play USB connection that does not require any drivers or setup. "The AcousticLink makes it easy and convenient to record any acoustic guitar into your computer or iPad," said Dan Radin, Alesis Product Manager. "We love to empower musicians to play, perform and create music with their platform of choice, and the AcousticLink does just that." The AcousticLink will be available from musical instrument and pro audio retailers Q3, 2011. It has a U.S. Retail Price of $69.00 and an estimated street price of $49.00.